So far in my research, I have found a number of Scrapbook Conventions or Expos or Scrapbook Retreats to crop, learn and purchase scrapbooking, rubber stamping and card making supplies. Most of these scrapbook events use pretty much the same model. Registration for events and classes can be done when the classes are up on the event websites - maybe 6 weeks prior to the event date. Why not Bookmark this Page so you can find it anytime so you don't miss an update? When I want to go to Scrapbook Conventions or Expos, I sign up for e-mail notifications early on so that when the classes and event information is posted, I can plan my classes and shopping accordingly to make the most of my trip. I have personally attended Scrapbook Expo, CK Convention, the Heirloom Productions Rubber Stamp & Paper Arts Festival, Stamp Scrap Art Tours and Croptopia Getaways when they are close to where I live. At Scrapbook Conventions or Expos, you can choose to fill up your days with workshops and classes and short breaks between can be spent on the Vendor exhibition or shopping floor, or you can spend your entire time shopping, or anything in between. If you purchase classes, you normally don’t have to pay for access to the vendor area. If you choose just to shop at any of the Scrapbook Conventions or Expos, all the vendors have great displays, and always have their latest products to demonstrate. Many will have "Show Specials" or coupons and if you make a purchase, many will have an additional show coupon to use later on their website. Many of the vendors also have "Make and Takes" for free or a minimal charge of a couple dollars where you can experiment with the new products and take home a sample. I love the classes and have found that spending $25 to $40 on a class has netted the instruction, a great item that usually gets completed and more supplies than I could have purchased for the price of the class. All the workshops feature or concentrate on new items or techniques. Most have a detailed description of the class and often a photo of the finished or similar product. The end result may be a group of cards, scrapbook layouts, an entire scrapbook with 20 completed pages, or home decor items. I have never been disappointed. If you take a look at the schedule below, you can find one of the Scrapbook Conventions or Expos for nearly every weekend. Shows, vendors and workshops are subject to change from time to time, but this page may not be updated as I may not get the word of the changes. Some vendors at the Scrapbook Conventions or Expos may need some Volunteer or Paid Assistance in setting up, tearing down, teaching classes, etc. so check the individual website to see what type of assistance you can give and what the Compensation for that assistance will be. There is a web address below each of the Scrapbook Conventions or Expos names for you to contact. For updates to each of these, I would suggest signing up for e-mail notification for those you are interested in. They will notify you when classes or workshops are posted so you can plan your time, and they will notify you again when it is time to register. While this page is originally devoted to Scrapbook Conventions or Expos, we have also located a number of Rubber Stamping events that tie in closely to Scrapbooking. Hope you will find something close to attend. For 2017 I deleted at several events from prior years. I don't know why, but from the few that I attend regularly, the attendance seems to be dropping. If there is an event close to you, please don't wait until next year as it may not be around next year. To find out more information for Scrapbook Conventions or Expos at a particular venue, go to the website link just under the title of the show, click on the location you are interested in. About 6-weeks prior, a list of classes will be posted and you can begin your registration shortly. Sign up and you will be on the list to receive email updates. If you sign up for Classes, you will receive a free ticket for the Vendor Floor. Crops are also available. Scrapbook Expo Fans can win 2 Free Admission Tickets each Monday. The Rubber Stamp, Scrapbook and Paper Arts Craft Show with a Treasure Chest - be one of the first 100 people in line and receive a key to the treasure chest. The person with the key that opens the chest will receive $100.00 in Tour Bucks to be spent at the show. Join in on the Make and Take Project Party on Friday nights before each show. No need to bring any supplies as vendors will have enough for you to complete each project. About half way through the Make and Take Projects they will have a great selection of desserts available - all included with your ticket. Tickets are only available online and are limited. Order your tickets early before they sell out! Ticket prices for 2018 are $6.00. Bella Crafts Connections is a brand new craft retreat for craft consumers. Their event at the Mall of America at 60 East Broadway, Bloomington, MN 55425, was created by Bella Crafts Quarterly™ editors, and was scheduled in September, 2016. Click on the link above to sign up for their Facebook page. Nothing new was listed for 2017 and at the time of this update Jan 4, 2018, there is nothing new listed for 2018. To find more information and to register for any of these events, go to the CK website mentioned above and check out the Events tab at the top of the page. CK has a Forum and if you need a roommate this is a good place to find one. Each CK Convention offers a Vendor Fair with various make-and-takes and demonstrations. The price is $7 in advance and $10 at the door. You can also purchase a 2-day pass at the door for $13. Children 9 and younger get in free. Seniors 65 and older $7 only with purchase at the door. Active Duty Military and K1-12 Teachers $5 at the door. There are more than 100 classes and workshops from $20 to $60, plus Daytime & Evening Crops. If you register online for three classes or activities, you can select the "CKC Show Special" to receive free vendor fair passes for Friday and Saturday. During the registration process, you can actually view some of the products that will be made during the classes and even see some videos of what will be available. It appeared for 2015 about 4 shows were removed from the listing from previous years - there are no longer any in the south east US. It appears for 2017 they dropped 7 more shows. For 2018 they added a new show at Manhester, NH for a total of Five shows. I am certainly sorry, as none are close enough for me to attend. Quick Quotes now has three types of events. Their long time Quick Quotes Private Reserve - 3 day Premier Scrapbook Educational Extravaganza events (Friday, Saturday & Sunday) with All Day Album Class, 4 additional classes, prizes, Make and Takes, and contests for $299.99. They have recently added the Quick Quotes Mini Reserve - 2 day Premier Scrapbook Educational Extravaganza (Saturday & Sunday) with an all day Album class & 4 additional classes, prizes, contests and Make and Takes for $199.99. And now the Quick Quotes Super Scrapbook Day - 1 day events (Saturday or Sunday) with the same goodies and 5 classes for $109.00. And a 14 Day Grand Tour of Spain May 10-23, 2018! A Friday evening, Saturday and Sunday full of great Quick Quotes classes far different and much more extensive than you will find at a regular Scrapbook Conventions or Expos. The price for the weekend is $299. Rooms are separate, so you can double up with a roommate or go it alone. If you register early enough, check out the reduced rates for the lodging for a great deal. However, lunch will be included on Saturday and Sunday. Aside from the wonder thank you gifts and prizes valued from $10 to $300, you will get 4 mini workshops and 6 major workshops and you will be completing an entire 20 page album in the 3 days you are there. There will be Crops and Games, Team Contests and Challenges. Their Crops are a little different, as everyone is guaranteed and end seat at the table and they also sponsor Cruises. Non stop cropping time room open 24/7. You can purchase a 1, 2 or 3 day pass to crop or shop or if you are traveling to the event and need to stay in the Lodging arranged for the Getaway, there are Meals and Snacks also included in the registration price. Just an example of a layout provided for the event, designed by Janet Wells, of Pictures in Time, Orange Park, Florida. If you are interested in attending one of these Conferences or scrapbook events you must sign in and complete a member or non-member application first as you have to have a membership ID # so plan ahead just a little. There is a $250 per person badge fee for Non-members. Go to their home page to sign up for email notifications so you can get registered as soon as the registrations are open for classes, crops and shopping. The GASC features a Vendor Fair for a $10 preregistration or $12 at the door, Classes for an additional charge based on the class, an All-Day Crop the day before the convention for $35, and evening crops on Friday and Saturday for $25. A combination "Crop & Shop" ticket is available; it provides access to the vendor fair and an all-day cropping area. The Vendor Fair costs $8 with preregistration or $10 at the door and has about 75 vendors and exhibitor booths. The convention also offers a Round Robin Mini-Class Marathon on Wednesday night for $40, Cropping Parties on Thursday and Friday nights for $15, and classes from $12 to $40. "Passports" are available from $30 to $50 that include three-day admission to the vendor fair and souvenirs. Class schedule should be posted around mid-February. Besides the Convention, these folks also have Retreats scheduled through out the year. And, most recently added to the List of Scrapbook Conventions or Expos are The Heirloom Productions Shows & StampFest by the Bay, listed below. Now including Art Rubber Stamping, Scrap and Memory Books, Card-Making, Paper Crafting, Book Arts and Calligraphy Arts! I attended this show several times and it was one of the best shows I have attended. It was a small show, but with actual room to walk around and it was OK to take in a wheeled cart for shopping. I picked up some of the best products ever at this show. The last couple of years, shows have been added and dropped, I am guessing based on attendance or location availability. Remember, however, to bring some Cash with you for the small entrance fee. Most vendors will accept credit cards at the exhibits. 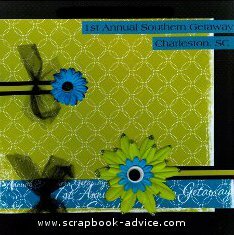 The Southeast's Premier Card Making, Rubber Stamping, Scrapbooking and Paper Crafts Shows. Escape to the beach with a weekend at Cambridge, Maryland. Early admission to sales with pre-ordered tickets. Nothing available for 2018 as of March 3, 2018, but the link is still active and updates are possible. The 22nd Annual Spring Adventures In Stamping Convention. Exhibits on Friday, Saturday and Sunday, April 27 and 29, 2018. Advanced tickets available, on-site Concessions and Overnight Accommodations available close by. A learning and shopping rubber stamping extravaganza! Each of the Scrapbook Conventions or Expos have Workshops or Classes and usually have a list of standard scrapbook tools and supplies of your own that you will need to bring - they can all be put in a small container. Scrapbook Advice Tip: I would suggest one that has a handle or shoulder strap or on rollers that is easy to carry or pull along with the goodies (remember the entire scrapbook) you will take from the class. At the CK Convention in Charlotte in 2010, I ended up with 2 completed 12 x 12 scrapbooks and 1 completed 8 x 8 scrapbook plus a number of odd sized items and it would have been impossible to carry all that without a tote. Remember you still have to get back to the car! I should remember to take my own advice! Scrapbook Advice Tip: The Scrapbook Conventions or Expos involve a lot of walking and standing so make sure you have good shoes for that. Many of these events are on a hard concrete floor. Scrapbook Advice Tip: When I shop at the Scrapbook Conventions or Expos, I take a scrapbooking file tote with a shoulder strap and swap it out with my rolling tote when I go to a class, and vice versa. The Crops available are all different according to the locations, the space, electrical outlet availability, etc. My best suggestion is to go with the flow and take a few items as necessary to complete your layouts. Scrapbook Advice Tip: Pre-plan your work and make your own "Kits" of items you think you want to add to those layouts. Don't try to take your entire inventory. It's exhausting trying to pack and tote all that stuff, and I think it detracts from the fun of the events. At Scrapbook Conventions or ExposThe Vendor Floor has many different types of vendors and you can see the products live and in person (great for me with no local scrapbook stores around) and you can participate in make-and-takes, contests, raffles and many demonstrations. It’s always nice for me to get to meet some of the owners, designers and product inventors at these events also - many of whom I have used and enjoyed products from. Most Scrapbook Conventions or Expos only allow you to take wheeled crop totes to the Cropping events or Workshops only, but they have usually have a place to check them at a convenient location when entering the shopping floor. Many Scrapbook Conventions or ExposCoupons have been available from many vendors, often coming with the registration information. If you need to Travel to a scrapbook event, most events have arrangements with Hotels very close by with discounted rates that you can take advantage of. I hope you can find one of the Scrapbook Conventions or Expos to attend this year or next. I have enjoyed the scrapbook events that I have been to and hopefully there is one scheduled near you. Scrapbook Advice Tip: Check the list for dates you may be on vacation or on a business trip, and you may be able to stop by one that you would not ordinarily be able to get to because of the traveling distance. If you are aware of any more Scrapbook Conventions or Expos in the United States or in other countries, please Contact Us so that we can add that information to assist our readers. Check out our Scrapbook Tutorials for more learning.